Present Simple Tense Read-Converse-Write Interactive Worksheets for Google Apps-ESL Fun Class! This interactive grammar worksheet is made with Google Slides. It has four pages which include a reading section, a conversation section and a writing section. The reading and conversation sections are divided once more into two tasks. Each task has five photos and text. The writing section has ten photos and blanks lines to compose sentences on. The fourth page is the answer key. Students will look at the photos and use the grammar topic to write about what is in them. Then students will use the photos to help them fill in the missing words in either the reading or conversation paragraphs. In the writing section, students will write about the photos and they will use the photos and the grammar topic to compose their own sentences. For more advanced students, try having them use some or all of the photos to write their own story or conversation. These worksheets can also be printed and handed out to students in class. You can save on printing costs by posting the worksheet links on your platform and have students complete them with Google Docs or you can project the material in class and have students write down the answers in their notebooks. As the actual documents are on Google Drive you must have a Google account to use them. Your links to these documents will be on the PDF you download with your purchase. Just click on the links at the bottom of the page and follow the instructions to add a copy to your Google Drive. You can then share the worksheet link from your Google Drive with as many students as you wish. 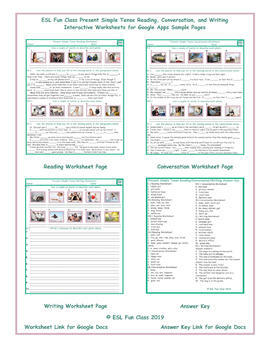 Be sure to download the sample page and zoom in to see all of the exercises clearly. We use the same target words and phrases on all of the resources created for one topic. This is done intentionally to reinforce the basic vocabulary and grammar structures for each topic. Therefore, you can use our worksheets, board and card games, exams and other Interactive PowerPoint games and presentations as complimentary activities for this game.